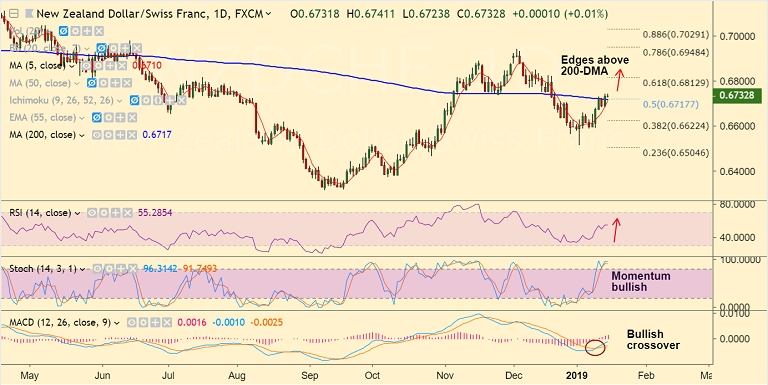 NZD/CHF is trading in an extremely narrow range, days high at 0.6741 and low at 0.6723. The pair closed above 200-DMA on Tuesday's trade and is consolidating at current levels. Technical studies support gains. Stochs and RSI are biased higher. MACD is showing a bullish crossover on signal line. Immediate resistance above 200-DMA lies at 50-DMA at 0.6751 ahead of 0.6822 (Dec 18 high). Retrace below 200-DMA and dip below 5-DMA to see further weakness. Call update: Our previous call (https://www.econotimes.com/FxWirePro-NZD-CHF-struggles-at-200-DMA-stay-long-on-break-above-1484344) is progressing well.